Update 29/5/16: While the title read 'paruti' earlier, the way I pronounced bread, someone on Twitter pointed out, and Pritha Sen confirmed, that it should be pau-ruti given that the Portuguese pav was the origin. More on this later someday. I was in Kolkata last week and had some of my favourite Bengali breakfast dishes at the ITC Sonar Hotel and The Oberoi Grand Hotels where we stayed. I had the luchi and chholar dal that my granny normally makes and I love and the French toast that my mother makes when I stay with her. She was out of town this time which is why we were in staying in hotels. I also had some beautiful kochuris (stuffed maida puris) at both hotels. 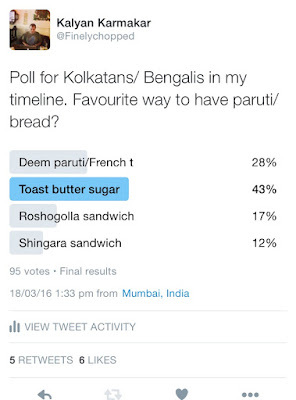 Now you might be wondering why I am calling the French toast a 'Bengali' dish? Well, actually the Bengali version of the French toast is savoury and not sweet. At its core lies salt, black pepper, green chillies and onion and not the usual sugar, honey and cinnamon powder. The Bengali, not so 'French' toast is actually a street food dish from the office para's or CBDs of Kolkata and is called deem pauruti. My first memories of deem paruti (egg on bread) is from the early 1980s. We had just moved into Kolkata from Iran and my mom used to take me to the International School which was then near Nizam's Palace in Kolkata. Nizam's Palace was an old palace (or so I think) converted into a government office building. There were lot of street food vendors there. My mom and I would stop for cut fruits and for deem parooti from the street food vendors there. The Hindi speaking moustachioéd deem pauruti-wala would beat an egg and add finely chopped chillies and onion to it. He would then soak a small loaf of bread in the egg. He would put the egg coated bread on a hand held wire grill and place this on an oven coal fire oven. The oven was a small, moveable barrel called an unoon (Bengali for oven). The egg would slowly begin to form into an omelette casing and the bread would crisp up. I was just about 7 years old then but that's how vivid my memories are of the deem paruti which I loved as a kid. It was a completely new life for me then and so different from what I was used to in Iran and England before that. Soon Nizam Place became a memory too once my dad passed away and I was shifted to an Indian ICSE Board school closer to home in South Calcutta. I had to then get used to a life of wearing uniforms in the Indian school instead of 'coloured' clothes which the International School allowed. The Indian school had exams while the International School didn't believe in exams at such as young age. In the International School the focus was on creative writing and we wrote stories on topics such as 'A suspicious looking man'. In the Indian school it was about 'essays' and not stories and that too about 'ten sentences on your ambition'. Or was it ' ten sentences on your cat'? Certainly prepared you for today's listicle crazy world! But this post is not about education systems. This post is about the role of bread in the life of Bengalis. Simple mass produced white bread. Nothing artisinal or poncy about it. My Maharashtrian friends such as Saee (who is writing a book on breads) tell me that it took a while for Hindu families in Mumbai to accept pav (local bread) baked in Goan and Muslims bakeries. It was considered to be 'alcoholic' as toddy was used to ferment it says Saee Koranne Khandikar. No such problems in Calcutta where bread was quite well accepted by the 1980s. It is called paruti (pa- leg, ruti- bread) as bakers used to stomp on the dough to mix it or so my mother tells me. You would get bread all across the city in Calcutta by the 1980s when we moved in. Sliced bread from the Modern brand and then small bakeries which would sell unsliced loaves. There were a couple of local bakeries close to the fields where we would play cricket near Rani Kuthi. I sucked at sports but the aroma of baking would draw me to the playing field. Apart from bread, these bakeries would also make something called 'tiffin cake' under brand names such as Farrini (fancy) or Baapi (more local). Little (6 by 4 by 4 inch) cubes of fruit cake to take to work and school. My mom would make French toast with sliced bread and eggs and make it for me even when I returned to Kolkata after I moved to Mumbai. My mother's French toast is a slightly fried version versus the grilled street corner deem parutis. My wife, a Parsi, believes that French toast should be sweet. Thankfully she doesn't like it so I can make my own version. The Bengali version of savoury French toast flummoxed Kurush Dalal too, another Parsi married to a Bengali. My mother also made these unique sandwiches for us. Two rasgullas stuffed between two slices of bread. One shingara (Bengali for samosa and dare I say nicer) squashed between two slices of bread. The usual chicken, tomato or boiled egg and butter sandwiches of course. Sliced bread saved us on days when the cook wouldn't come to work and there were no rotis at home. Mom would make chicken curry or chicken stew and serve it with bread. Bread, or rotis, are never paired with fish by Bengalis. With fish it has to be rice. 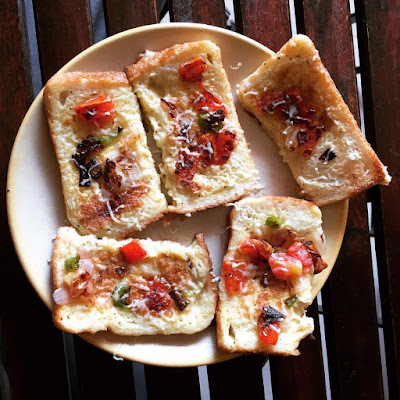 A classic combination in Kolkata was chini toast or shyaka paurooti (bread grilled on an open flame) with makhon (butter) and chini (sugar) sprinkled on it. The crunch of sugar of hot toast and butter is a pleasure that remained forbidden to me as my health conscious mother drew a line at sprinkling sugar on food. She was fine with the roshogolla sandwich though! 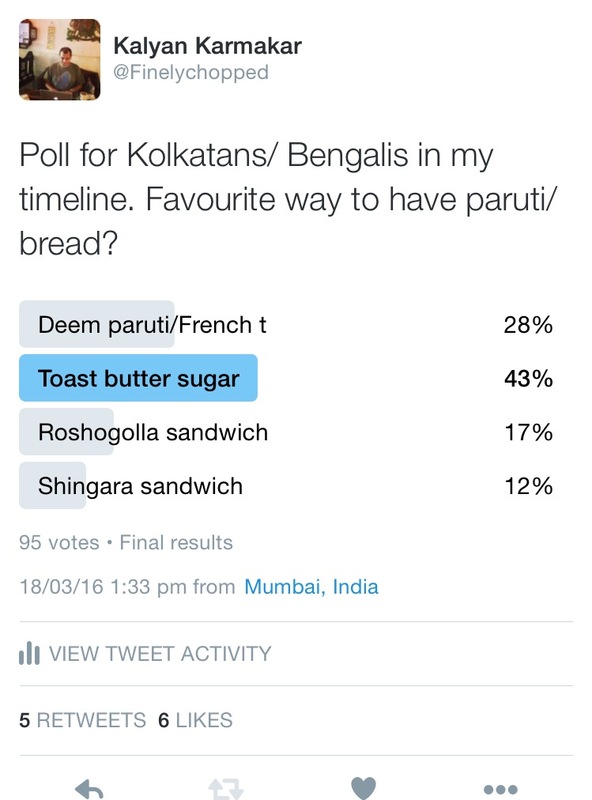 I did a quick Twitter poll among Bengalis on my timeline (not representative sample etc) on bread preferences among Bengalis. 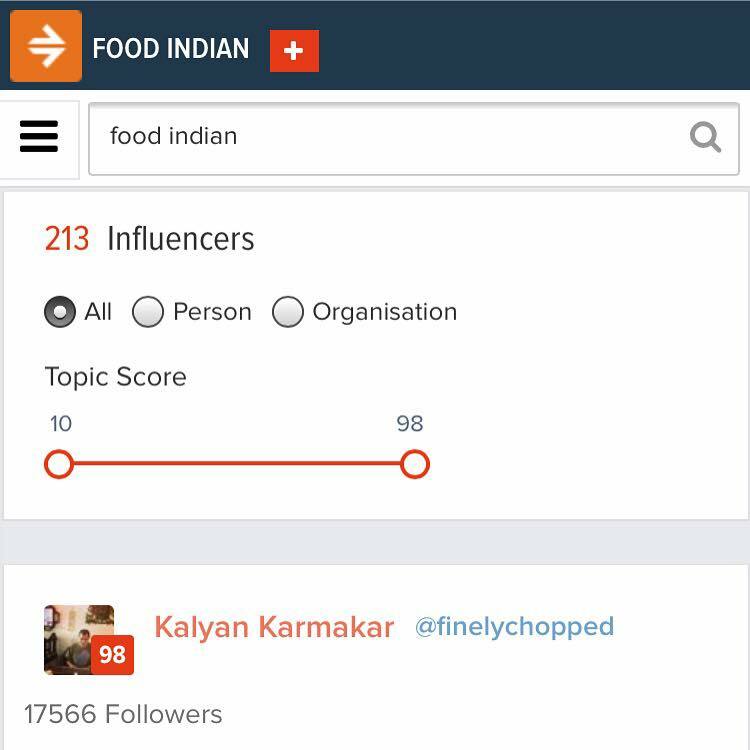 While French toast took an early lead, things changed after @twitterfood retweeted the poll and chini toast was the clear winner at the end. I am sure that our family would have voted for the deem pauruti though. Which explains why making a French toast for my breakfast a few days back gave me such unbridled pleasure. PS I must include one mention on Twitter which I couldn't include as Twitter allows only 4 options in the poll. Ghoogni paruti as Anand reminded me. Talking of Twitter, I am very happy to share some lovely news with you. 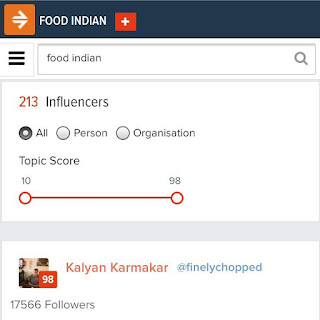 A report done by Right Relevance puts @finelychopped as the most influential Twitter Food Indian accounts. Thanks for all your support and please follow me on Twitter if you don't already. Here's the link to the study which features some great accounts to follow and with whom I am happy to have been featured. Was so happy to see this. I studied in Calcutta for 5 years. And it was mostly referred to as deem pao, which small roadside stalls would serve, cooked on a pan (the kinds which also served tea and Maggi). Think the word pao has caught on? It would be always be Pauruti (Pav+Roti) in Kolkata. Pao/Pav is more to do with Mumbai/Maharastra/Western India I guess.